Samuel Ortom, the Benue State Governor, has described as baseless allegations made by Adams Oshiomhole, the All Progressive Congress (APC) National Chairman that he (Ortom) embezzled about N23 billion government’s fund. 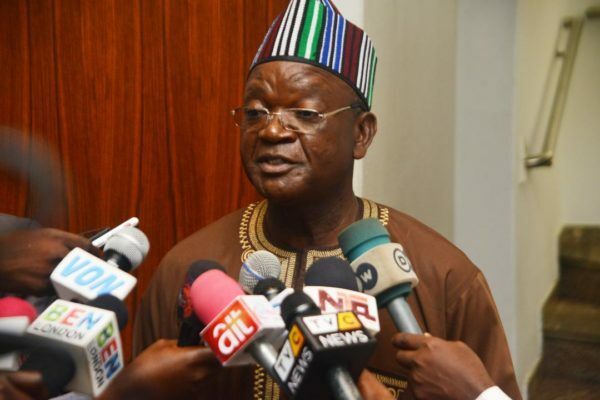 Ortom, who said he was prepared to waive his immunity to pave way for investigation and subsequent prosecution, noted that the allegations were an indication that the party has lost steam and has nothing to offer the people of Benue ahead of the elections. The governor, who was speaking at a Thanksgiving Mass organised in his honour by Isherev and Utyondu communities in Guma and Makurdi Local Government Areas of the state at Saint Francis Mission, Daudu on Sunday, described the allegations as smear campaigns against his person. Ortom was reacting to a statement credited to Oshiomhole during the flag-off of the APC gubernatorial campaign in Makurdi on Saturday in which the APC national chairman alleged that the governor had siphoned billions from government coffers. Oshiomhole had vowed that Ortom would be picked up by relevant authorities as soon as his immunity expires as state governor on May 29, 2019, over allegations of N23 billion embezzlement. Represented by Kashim Imam, Oshiomhole explained that a whopping sum of N19 billion was withdrawn from the Special Services Account of the state as well as another N1.9 billion from the Government House account as part of the fraud. Oshiomhole threw back at Governor Ortom one of his slogans in pidgin English, which says: “If you chop money, money will chop you”, meaning that anyone that embezzles money would bear the consequences. He insisted that the Benue State governor must be made to account for monies that he allegedly embezzeled during his tenure. George Akume, who spoke at the occasion, also alleged that the funds embezzled by the governor were used to fund his business concerns in China.